A survival adventure, The Mountain Between Us is a two-person character study that intermittently connects but also drags on for too long. Photojournalist Alex Martin (Kate Winslet), traveling to her wedding, is stranded at an airport when her flight is cancelled due to an incoming storm. She spots fellow traveler Dr. Ben Bass (Idris Elba) on his way to perform a surgery and equally frustrated by the delays. Alex and Ben team up to charter a small plane from grizzled and dishevelled Vietnam War veteran Walter (Beau Bridges) and his dog. Walter does not file a flight plan, and during the flight suffers a stroke. The plane crashes in the remote snow-covered mountains in a Utah wilderness area. Ben, Alex and the dog survive, although Alex suffers a broken leg. They shelter for days in the half-destroyed plane cabin against the bitter cold, but help does not arrive. With food running out, and against Ben's wishes, Alex insists that they need to leave the crash site and start descending the mountain to reach help. 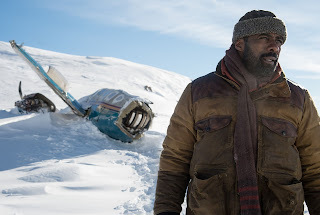 Directed by Hany Abu-Assad as an adaptation of the Charles Martin novel, The Mountain Between Us is a chilling drama about surviving the elements and unanticipated closeness with a stranger. The hip-deep snow, unimaginable cold, blinding storms, injuries, wild animals and isolated mountains provide plenty of physical challenges for Ben and Alex to overcome. And Abu-Assad doesn't hide from some awkward details: how does a woman with a broken leg urinate in a cramped cabin with a strange man for company? But of more interest is the connection that needs to be forged between two travelers with nothing in common, and indeed plenty of rub points. Alex is talkative, inquisitive and a risk-taker. With her chase-the-story instincts, she is unable to sit still and await rescue, despite a broken leg. Ben is quiet, reserved, cerebral and slow to share anything intimate about himself. Applying the methodical logic of a surgeon, he finds Alex's impulsiveness grating. The fact that Alex instigated the ill-fated charter adds to the strain between them. The journey from frigid distance to the warmth of dependency underpins the film, and of course their contrasting character traits will need to merge in the name of survival. Abu-Assad gets the most out of the story, but at 112 minutes, there is more film than plot. There are only so many arguments and encounters with near death that two people can carry, and by the time a bear trap snaps, an inevitable tired sense of "what else" creeps into the film. The denouement back in civilization also drags out longer than needed. Kate Winslet and Idris Elba easily maintain watchability, the two stars enjoying several emotional highlights. Winslet gives Alex a stubborn vivaciousness, while Elba allows the cover of calm silence to regularly lift and reveal hidden pain and frustrations within. Beau Bridges as the pilot and Dermot Mulroney as Alex's husband-in-waiting get a few scenes, but the real co-star is the dog, who provides essential companionship without undue cutesiness. 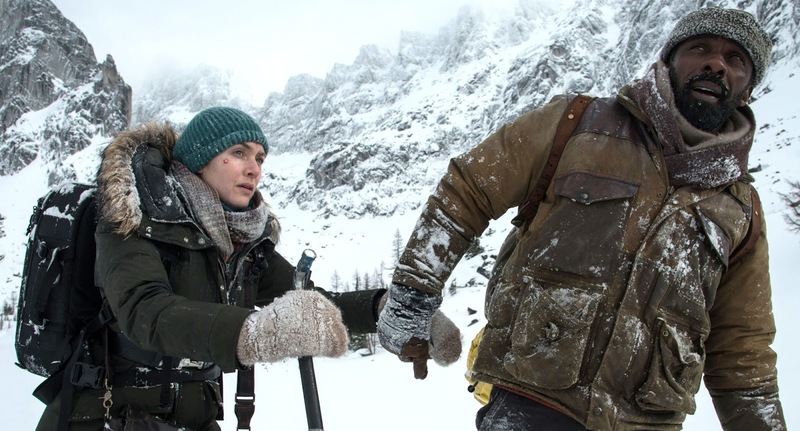 The Mountain Between Us is worth traversing, but it is a bit of a trudge.